Materials and Methods: This study was a clinical trial on 66 male and female nurses working in intensive care units (dialysis, ICU, and CCU) of Isfahan University of Medical Sciences, Iran, in 2013. Participants were selected according to the aims and inclusion criteria of the study. Then, they were randomly divided into experimental and control groups. The Occupational Stress Inventory (OSI) (Osipow and Spokane, 1987) was completed by participants of the two groups before, immediately after, and 2 weeks after the intervention. General Swedish massage was performed on participants of the experimental group for 25 min in each session, twice a week for 4 weeks. Data were analyzed by descriptive and inferential statistics [Chi-square, t-test, and repeated measures analysis of variance (ANOVA)] using SPSS software. Personnel are the most valuable assets of any organization, are at the disposal of the managers, and their individual performance affects the performance of the entire organization. One of the factors affecting performance in organizations is organizational stress, which puts the health of many staff at risk. Stress or mental stress is the most common, comprehensive, and destructive force in today’s society. One of the main causes of stress in the life of an individual is their career. Occupation, for each individual, is a constituent element of their social identity, the source of living requirements, forms their social relationships, and is one of the main sources of stress. Occupational stress is a serious and chronic health problem and is the cause of behavioral problems such as increased alcohol and tobacco consumption. In addition, it is the cause of growing concern among employers and employees. Stress reduces employee productivity and increases absenteeism, retirement and disability costs, and economic costs imposed directly on employers., Thus, it has become a common and costly problem in today’s business environment. The International Labour Organization reported that increase in occupational stress has caused countries to spend 10% of their gross national income. Moreover, occupational stress increases health care costs; employees with higher levels of occupational stress have 50% higher health care costs. Statistics have shown that occupational stress has become more common and more expensive than before; direct medical costs associated with stress-related problems in the United States are estimated to be about 150–300 billion dollars. The United Nations has considered occupational stress as a modern disease of the century and a major health threat, and the World Health Organization has declared it a global pandemic. In several studies, it has been found that about 30% of the workforce in developed countries suffers from occupational stress and this number is much higher in developing countries. According to estimates in America, the average rate of absence from work due to severe stress was 4 times the average rate of absence from work due to illness and nonfatal injuries. The rate of occupational stress is higher among health professionals compared to other professionals. The high levels of stress among nurses, physicians, hospital administrators, and health professionals are related to the nature of their work. In the nursing profession, high concentration and strong teamwork required during work and providing 24-h care cause high rates of occupational stress, and thus, stress is a recognized component of modern nursing., The results of a study on a large sample of Swedish nurses indicated that more than 80% of nurses reported higher levels of stress than other professional groups. Levels of stress and stressors vary in different wards, and this difference is due to the working conditions and duties assigned to nurses. Intensive care units (ICUs) are stressful atmospheres because of the complexity and dynamic nature of their environment. The use of sophisticated technical equipment is one of the challenges of ICUs. ICU stressors include: Working relationship with nurses and other health care team members, communication and conversations with the patient, the high levels of knowledge and skills needed to work in this ward, high workload, the need to respond quickly and promptly to situations with urgent care requirements, and heavy responsibility arising from the care of the patients., Moreover, other sources of stress for experienced nurses are excessive workload, management or leadership style, professional conflicts, and emotional baggage. Some research results show that nurses working in ICUs, due to more frequent exposure to occupational stressors and the sensitive nature of their profession, probably experience the most work-related injuries compared to other employees. In addition, they are more susceptible to burnout, job dissatisfaction, function disorders, and cardiovascular, gastrointestinal, muscular, and neurotropic disorders. The studies by Abdi and Shahbazi and Rahmani et al. on nurses in ICUs showed that 49.2% of nurses had high level of stress due to working in the mentioned wards. The results regarding the six dimensions of stress showed that in terms of workload 25–27.4%, incompetence 26.3–54.1%, dichotomy 40.5%, range of nurses’ role 31.3–62.5%, responsibility of their role 33.3–48.9%, and physical environment 48.4%–54.2% of nurses had occupational stress. Present studies show that massage in the workplace is an appropriate way to relieve stress. For example, a study suggested that staff who received 20 min of massage twice a week for 8 weeks reported lower levels of anxiety and sleep disturbance, and decreased blood pressure and heart rate. In a similar study on massage therapy for 15 min for 6 weeks, systolic and diastolic blood pressure was reduced. 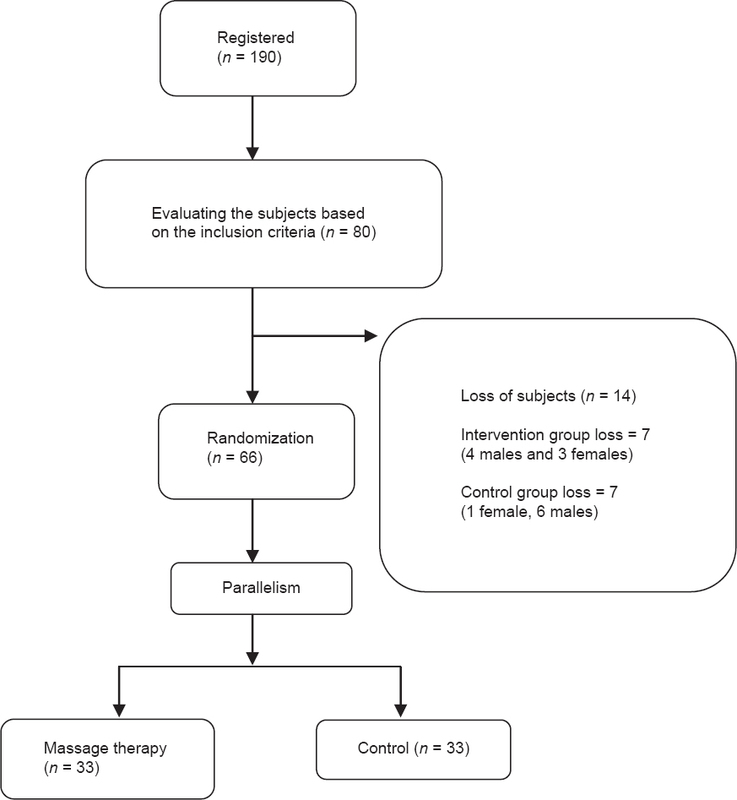 In a meta-analysis of 37 massage therapy studies, involving 1802 participants, of whom 795 received massage therapy and 1007 patients did not, significant differences were observed between the treatment groups at different levels. Furthermore, participants who had received massage had considerably lower rate of anxiety, blood pressure, and heart rate. These results indicated that massage therapy can be a powerful tool for immediate, effective changes on general health. Although the results of Davis et al. in 2005 showed that aromatherapy massage with music caused an immediate positive impact on the anxiety levels of emergency nurses, their stress levels and number of sick days were not reduced, and there were high levels of job stress related to workload. Given the inevitability of some stress factors in the nursing profession and the need to prevent mental and behavioral effects of stress, applying measures and steps toward reducing stress and training stress management is required. In addition, prevention is better than cure; thus, finding non-pharmacological approaches, such as massage therapy, for nurses’ occupational stress can lead them to a healthy life and reduce occupational complications. This can lead to the empowerment of nurses in coping with stressors, and this in turn leads to better outcomes and increased productivity for nurses. Increased productivity will result in advantages such as reduction of nosocomial infections, nurse retention, effective use of the nursing workforce, and increased satisfaction of patients, nurses, physicians, and employees. In this way, the economic, social, and psychological burden to nurses and the community is reduced. Nurses in ICUs are exposed to great and consistent stressors due to the nature of their profession, experience the most work-related injuries than other employees, and there is no scheduled programming to maintain the health of these healthcare providers. Moreover, maintaining a healthy nursing workforce, primarily as human beings and secondly as individuals who protect the health and well-being of other members of society, is essential. Therefore, the researcher conducted this study to determine the effects of massage therapy on the occupational stress of ICU nurses and hope to have taken steps toward reducing nurses’ stress, increasing their capacity and efficiency, and improving the quality of nursing care for patients in the ICU. This study was a randomized clinical trial 20114042217387 performed with two groups of subjects. It was performed in three stages of before, immediately after, and 2 weeks after the intervention. It was performed on 66 male and female nurses working in intensive care units (dialysis, ICU, and CCU) in the treatment centers of Alzahra, Chamran, Kashani, and Noor hospitals affiliated to Isfahan University of Medical Sciences, Iran, in 2013. The number of subjects needed to conduct the research taking into consideration 10% loss was estimated at 80 in total (40 subjects in each group). By the end of the study, there was a loss of 14 subjects: 3 men and 2 women from the intervention groups due to lack of participation, 1 man due to family problems, 1 woman due to traveling, and 7 people from the control group due to not completing the questionnaire were excluded from the study. Finally, the study was performed on 66 subjects (33 in experimental group and 33 in control group) [Consort Diagram]. The inclusion criteria included willingness to participate in the experiment and receive a massage, having a score of less than 150 according to the Holmes and Rahe stress scale, having a total occupational stress score above 134 according to the Occupational Stress Inventory (OSI), not being treated with relaxing techniques such as meditation and yoga or tranquilizers and anti-anxiety medications, absence of edema, inflammation, and fractures in the areas of massage, and having no acute or chronic disease. After obtaining an informed written consent from the participants, they were randomly enrolled into one of the study groups using draw (experimental group and control). The control group did not receive any intervention. The questionnaires were given before and immediately after the intervention and 2 weeks after completion of the study (6 weeks). The experimental group received massage therapy for 4 weeks, 2 times a week for 25 min, in a warm quite room with efficient light, temperature, and ventilation, located in special units of each treatment center., The technique used for the intervention in the experimental group was the general Swedish massage. First, the technique was described to the participant. Then, it was applied to the hands, legs, back, chest, and lower back by the researcher and a female colleague (after passing a theoretical and practical training course on massage therapy). The researcher and his research partner tried to have a calm mind at the time of the massage intervention. They had comfortable clothing, with short nails and without wearing a ring or any other means that would harm the subject’s skin. Each of the subjects in the experimental group was given disposable clothing. Then, each of the subjects sat on a chair and relaxed for 3–5 min; they would lean on the chair and open their legs to shoulder width in a way that the legs were not stretched. To massage the hands, a pillow was placed on the subject’s lap and the palms of their hands were placed on them facing upward. The researcher rubbed the Firozeh Massage Lotion with a coconut scent on his hands and started the procedure. Both hands were used for massage; the fingers were stuck together and stroking motions were performed on the surface of the skin with moderate pressure of the palms using massage lotion. During the massage, the researcher’s hands did not part from the subjects’ body. The participants were asked not to participate in any other counseling and psychotherapy programs until the end of the study and to continue their normal living routine. Then, they were all asked to complete the demographic information form. The exclusion criteria included participation in other complementary medicine programs during the study, unwillingness to continue participating in the study, use of anti-anxiety drugs and other psychiatric medications during the study, experiencing acute stress during the study, or having acute or chronic illnesses that affect a person’s mental state. The data gathering tool was a questionnaire, which was completed before, immediately after, and 2 weeks after the intervention by the researcher. The questionnaire consists of two parts. The first section consists of 12 questions relating to personal and professional information, including age, gender, marital status, education level, number of children, income, years of work experience, work experience in the ICU, type of employment, and work shifts. The second part includes the OSI, which was first used in 1987 by Osipow et al. This instrument has been frequently used by researchers in the country and its reliability was calculated and verified with Cronbach’s alpha at a satisfactory level of 0.89%. It consists of 60 questions and is graded based on a 5-point Likert scale, from never to always. This questionnaire consists of six scales: Role Overload is related to how people respond to the demands of the workplace; Role Insufficiency is related to the amount of proportionality between skills, education, training, and experiential and learning characteristics of the individual and workplace requirements; Role Ambiguity is related to the knowledge of the person regarding the priorities and expectations of the workplace and evaluation criteria; Role Boundary is related to individual differences in terms of work ethic and the role expected of them; Responsibility is related to the individual’s sense of responsibility in terms of performance and well-being of others in the workplace; and Physical Environment is related to unfavorable environmental conditions that the individual is exposed to. Each scale contains 10 questions. In the OSI, the stress levels were determined in each of the six scales by four levels of lower than normal, mild stress, moderate stress, and severe stress. Collected data were analyzed using Chi-square test, Student’s independent t-test, and repeated measures analysis of variance (ANOVA) using SPSS for Windows (version 18; SPSS Inc., Chicago, IL, USA) [Figure 1]. The Author declares that have no conflict of interest in this study and they have surveyed under the research ethics. The findings of this study showed that the mean age of the participants in the experimental group was 34.1 ± 5.9 and in the control group was 34.6 ± 6.8. The mean number of years of work experience in the experimental group was 10.6 ± 6.0 and in the control group was 10 ± 5.69. The number of female participants in both groups was more than the number of male participants (51.5% in the experimental group and 63.3% in the control group). Most of the participants in both groups had a bachelor’s degree in nursing (experimental group 90.9% and control group 97%), were working in ICU (experimental group 66.7% and control group 72.7%), and working in shifts (experimental 84.5% and control 78.3%). There was no significant difference between the two groups in terms of age, gender, education level, marital status, number of children, career, type of employment, working shifts, and working position (P > 0.05). Student’s independent t-test results showed that the mean score of stress before the intervention between the two groups of control and experiment was not significantly different (P > 0.05). Nevertheless, immediately after and 2 weeks after the intervention, the mean score of occupational stress in the experimental group was significantly lower than that in the control group (P < 0.05) [Table 1]. Repeated measures ANOVA results also showed that the mean total score of occupational stress in the experimental group before, immediately after, and 2 weeks after the intervention was significantly different (P < 0.05). However, in the control group, the mean total score of occupational stress before, immediately after, and 2 weeks after the intervention had no significant difference (P > 0.05) [Table 1]. Furthermore, the results of post-hoc least significant difference (LSD) test showed that the score of occupational stress between the time before and after the intervention (P < 0.05) and also between the time before and 2 weeks after the intervention (P < 0.05) in the experimental group was significantly different. Student’s independent t-test results showed that the mean scores of the six scales of occupational stress before the intervention between the control and experimental groups were not significantly different (P > 0.05). Nonetheless, immediately after and 2 weeks after the intervention, the mean scores of the six scales of occupational stress in the experimental group were significantly lower than those in the control group (P < 0.05) [Table 2]. Findings from this study showed that the mean scores of occupational stress in the control group, which did not receive any intervention, immediately after the intervention and 2 weeks after the intervention had no significant difference compared to before the intervention. However, in the experiment group, the mean score of occupational stress after the intervention compared to before the intervention had significantly decreased. Moreover, this reduction had remained for 2 weeks; thus, it can be concluded that the intervention of massage therapy can be effective in reducing occupational stress. In this regard, the study by Sharp et al. suggested that the touch in massage causes biochemical changes by reducing cortisol, and reduces stress and improves mood by increasing serotonin and dopamine. In addition, in a study by Day et al., it was shown that massage is an appropriate way to reduce stress in the workplace. Their results showed that staff who received 20 min massage, 2 times a week for 8 weeks, reported reduced levels of stress and less sleep disturbance. In a meta-analysis by Repar and Patton of 37 studies involving 1802 participants, 795 of whom had received massage therapy and 1007 patients had not received massage, there was a significant difference between treatment groups; participants who received massage therapy had significantly lower levels of anxiety (P < 0.01). These results indicated that massage is a powerful tool that can make a positive impact on the general health of nurses. In addition, the study by Bauer et al. on the impact of massage therapy on pain, anxiety, and stress in patients undergoing cardiac surgery concluded that massage therapy significantly reduces stress and anxiety. Noto et al., in their study, showed that back massage causes significant psychosocial improvement and stress reduction. In addition, after the massage, the levels of chromogranin significantly increased, but no effect was observed on salivary amylase and cortisol levels. A clinical trial showed that eight sessions of massage therapy led to statistically significant changes in anxiety, depression, well-being, vitality and general health, and perceived stress, compared to eight sessions of guided relaxation. Furthermore, it can serve as an important strategy to maintain health and prevent anxiety, depression, and perceived stress in the elderly. The results of the present study showed that the mean scores of the six scales of occupational stress in the control group had no significant difference immediately after and 2 weeks after the intervention compared to before the intervention. However, in the experimental group, the mean scores of the six scales of occupational stress (Role Overload, Role Insufficiency, Role Ambiguity, Role Boundary, Responsibilities, and Physical Environment) after the intervention compared to before the intervention had significantly decreased. This decrease lasted until 2 weeks after the intervention and it can be concluded that therapeutic intervention was effective in reducing occupational stress in the six scales. In this context, Gholamnejad and Nickpeyma, in their study, aimed to investigate the causes of occupational stress in nurses and showed that the most important job stressor is high workload. Khaghanizadeh et al. also reported that the highest levels of job stress were due to workload which increased stress and fatigue at rest, exhaustion, and decreased job satisfaction. A team of researchers found that high workload and exposure to mortality were the most threatening stressors for nurses. In the study by Davis et al., massage did not have an effect on occupational stress in Role Overload, Role Ambiguity, and Responsibility scales (P = 0.41, P = 0.28, and P = 0.12, respectively). The reasons for the lack of effect of massage therapy in this study can be the use of experimental group as the control group or having a single group. One of the other reasons can be the short duration of the massage. Although the study of Bahrami et al. aimed to investigate the occupational stress of nurses in hospitals of Kashan, Iran, and showed that the highest difference of stress scores was in the Role Inefficiency scale (P = 0.0003), the study by Motavaripoor et al. on the effect of progressive muscle relaxation on the stress of nurses in ICUs showed that the mean stress scores before the intervention and after the intervention had a significant difference in Role Overload (P < 0.03). The study by Saarikoski on nurses working in ICUs of hospitals in Canada showed that physical environment and high workload were the main sources of stress in this group. Moreover, the study by Abdi and Shahbazi on ICU nurses showed that the most important sources of stress were the physical environment and responsibility. Regarding the physical environment, Cole believes that the mental and physical health of 93% of the nurses is frequently affected by physical environment stressors. In Lee and Wang’s study on occupational stress of nurses and its related factors, job responsibility has been reported as occupational stress. Confirming the results of the present study, Gholipour et al. showed that zinc supplementation reduced the level of stress among nurses working in ICUs; however, this reduction was not statistically significant. Zinc supplementation resulted in a significant decrease in Role Overload, Role Ambiguity, and Responsibility in the intervention group; however, in the control group, no significant differences were observed in any of the scales of occupational stress. The results of the present study showed that nurses working in ICUs of hospitals affiliated to Isfahan University of Medical Sciences, as an example of Iran’s nursing staff, have relatively high levels of occupational stress. In addition, the intervention of massage therapy reduced the occupational stress of nurses in the ICUs, and it can be concluded that the effect of massage therapy will remain after the intervention period. According to the results of this study, it is suggested that massage therapy can be used as a method suitable for nurses working in ICUs in order to reduce stress, promote mental health, and prevent a reduction in quality of nursing work life. This article was derived from a master thesis of Mojtaba Mirzamohamadi with project number 392001, Isfahan University of Medical Sciences, Isfahan, Iran. Our appreciation goes to all the nurses participating in this study, Mrs. Niloufar Binaiee for performing the intervention in female subjects, and the Deputy of Research of School of Nursing and Midwifery, Isfahan University of Medical Sciences who helped in the process of implementation. Vali L, Ravangard R. Study of effective factors on nurses job motivation in Kerman University of Medical Sciences teaching hospitals in 2007. Hospital 2009;8:24-9. Kazemi S, Javidi H, Aram M. The Effect of Communication Skills Training on Job related Stress of the Experts. Quarterly J New Approaches Educ Administration 2011;1:63-79. Doppia MA, Estryn-Béhar M, Fry C, Guetarni K, Lieutaud T; Survey Steering Committee SESMAT. Burnout in French doctors: A comparative study among anaesthesiologists and other specialists in French hospitals (SESMAT study)]. Ann Fr Anesth Reanim 2011;30:782-94. Caulfield N, Chang D, Dollard MF, Elshaug C. A review of occupational stress interventions in Australia. Int J Stress Manag 2004;11:149-66. Day AL, Gillan L, Francis L, Kelloway EK, Natarajan M. Massage therapy in the workplace: Reducing employee strain and blood pressure. G Ital Med Lav Ergon 2009;31:B25-30. Medibank Private Australia. The cost of workplace stress in Australia. Australia: Medibank Private Limited; 2008. ABN 47 080 890 259. Borritz M, Rugulies R, Christensen KB, Villadsen E, Kristensen TS. Burnout as a predictor of self-reported sickness absence among human service workers: Prospective findings from three year follow up of the PUMA study. Occup Environ Med 2006;63:98-106. Ongori H, Agolla JE. Occupational stress in organizations and its effects on organizational performance. J Manag Res 2008;8:123-35. Clark MC. The cost of job stress. Available from: http://www.mediate.com/articles/clarkM1.cfm. [last accessed on 2005]. Al-Hawajreh K. Exploring the relationship between occupational stress and organizational commitment among nurses in selected jordanian hospitals. An-Najah Univ Jr Res 2011;25:1931-75. Sharifian SA, Aminian O, Kiani M, Barooni SH, Amiri F. The evaluation of the degree of occupational stress and factors influencing it in forensic physicians working in Legal Medicine Organization in Tehran in the autumn of 2005. Sci J Forensic Med 2006;12:144-50. Salmaani Barough N, Taghavi Larijani T, Monjamed Z, Sharifi N, Bahrani N. Coping with stress. Hayat 2004;10:21-7. Gelsema TI, van der Doef M, Maes S, Janssen M, Akerboom S, Verhoeven C. job stress in the nursing profession: The influence of organizational and environmental conditions and job characteristics. Int J Stress Manag 2005;12:222. GHolam Nejad H, Nikpeyma N. Occupational stressors in nursing. Iran Occup Health 2009;6:22-7. Fathi M. Incidence rate and sources of stress among nurses working in intensive care unit of Kurdistan University of Medical Scienses. Sci J Kurdistan Univ Med Sci 2003;7:53-62. Bahrami A, Akbari H, Mousavi S, Hannani M, Ramezani Y. Job stress among the nursing staff of Kashan hospitals. Feyz 2011;15:366-73. Azad-marzabadi E, Tarkhorani H. The Relation between Job Stress and Job Satisfaction in a Group of Personnel. J Behav Sci 2008;1:121-9. Letvak S, Buck R. Factors influencing work productivity and intent to stay in nursing. Nurs Econ 2008;26:159. Gholipour Baradari A, Hoseini S, Zamani Kiasari A, Ala Emami Zeydi S, Mahdavi A, Mirbakhshi S. Effect of Zinc Supplement on Job Stress of ICU Nurses. J Babol Univ Med Sci 2013;15:38-45. Zupiria Gorostidi X1, Huitzi Egilegor X, Jose Alberdi Erice M, Jose Uranga Iturriotz M, Eizmendi Garate I, Barandiaran Lasa M, et al. Stress sources in nursing practice. Evolution during nursing training. Nurse Educ Today 2007;27:777-87. Zeighami Mohammadi SH, Asgharzadeh Haghighi S. Relation between Job Stress and Burnout among Nursing Staff. Sci J Hamdan Univ Med Sci 2011;19:42-52. Perhats C, Keough V, Fogarty J, Hughes NL, Kappelman CJ, Scott M, et al. Non-violence-related Workplace Injuries among Emergency Nurses in the United States: Implications for Improving Safe Practice, Safe Care. J Emergency Nurs 2012;38:541-8. Abdi H, Shahbazi L. Occupational stress in Intensive Care Unit nurses and its relationship with occupational burnout. J Shaheed Sadoughi Univ Med Sci 2001;9:64-9. Noto Y, Kudo M, Hirota K. Back massage therapy promotes psychological relaxation and an increase in salivary chromogranin A release. J Anesth 2010;24:955-8. Benavente SB, Costa AL. Physiological and emotional responses to stress in nursing students: An integrative review of scientific literature. Acta Paulista de Enfermagem 2011;24:571-6. Cooke M, Holzhauser K, Jones M, Davis C, Finucane J. The effect of aromatherapy massage with music on the stress and anxiety levels of emergency nurses. J Clin Nurs 2007;16:1695-703. Dehghannyieri N, Salehi T, Asadinoghabi A. Assessing the quality of work life, productivity of nurses and their relationship. Iran J Nurs Res 2008;3:27-37. Sharpe PA, Williams HG, Granner ML, Hussey JR. A randomised study of the effects of massage therapy compared to guided relaxation on well-being and stress perception among older adults. Complement Ther Med 2007;15:157-63. Shahrakivahed A, Mardani Hamuleh M, Sanchuli J, Hamei Sharakei S. Assessment of the relationship between mental health and job stress among nurses. J Jahrom Univ Med Sci 2011;8:40-3. Motavaripoor P, Ghaedi Heidari F, Bagheri I, Memarian R. The Effect of Progressive Muscle Relaxation on The Occupational Stress of Nurses in Critical Care Units. Res Q Stud Res Comm 2013;14:9-15. Saarikoski M. Mentor relationship as a tool of professional development of student nurses in clinical practice. Int J Psychiatr Nurs Res 2003;9:1014-24. Cole D, Nelson L. Stress at work: The relationship between hope and health in hospital nurse. Psychosoc Nurs 2001;26:7-18.